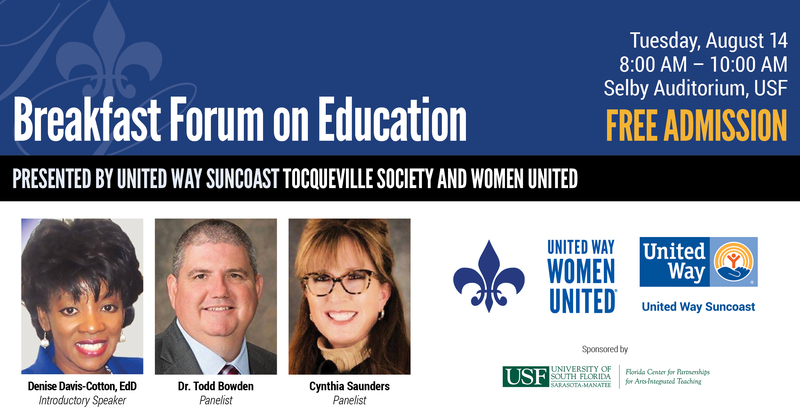 Women United is holding two very special events with notable speakers in the coming months to discuss a topic critical to United Way Suncoast’s work: Education. On Tuesday, August 14th from 8:00-10:00am at the Selby Auditorium at the USF Sarasota Manatee campus, we will have both the Superintendent of Sarasota County Schools, Dr. Todd Bowden and the Superintendent for Manatee County Schools, Ms. Cynthia Saunders join us for a panel discussion. The discussion will focus on the recently approved property tax proposal dedicated to continue support to Sarasota schools for more hours and resources and the new millage increase in Manatee County to provide the same. We will be discussing with both Dr. Bowden and Ms. Saunders the plans for the effective utilization of this funding and how the accountability for progress will be managed along with other critical issues such as plans to increase school safety. Thanks to USF’s kind sponsorship this event is free of charge. On Wednesday, September 12th from 11:30AM -1:30PM, we will hold a lunch forum on education for Wednesday, at Armature Works. 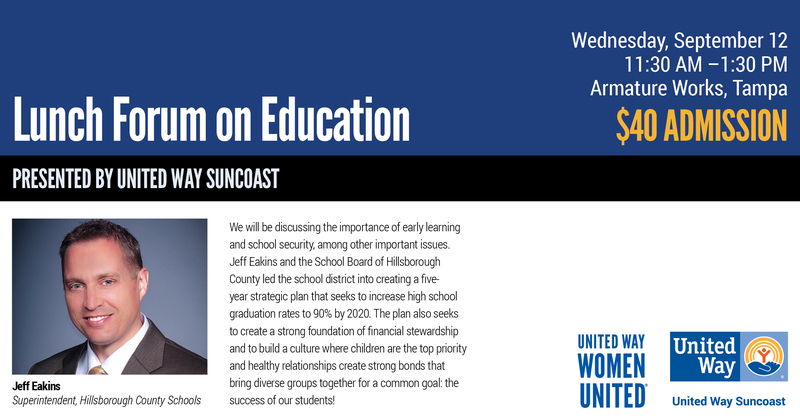 Superintendent of Hillsborough County Schools Jeff Eakins will join us to discuss his perspective on the importance of early childhood experiences and quality childcare, his district’s school readiness initiative, and school security, among other important issues.